Between Hailey and Ketchum, road works closed one direction of traffic at a time. 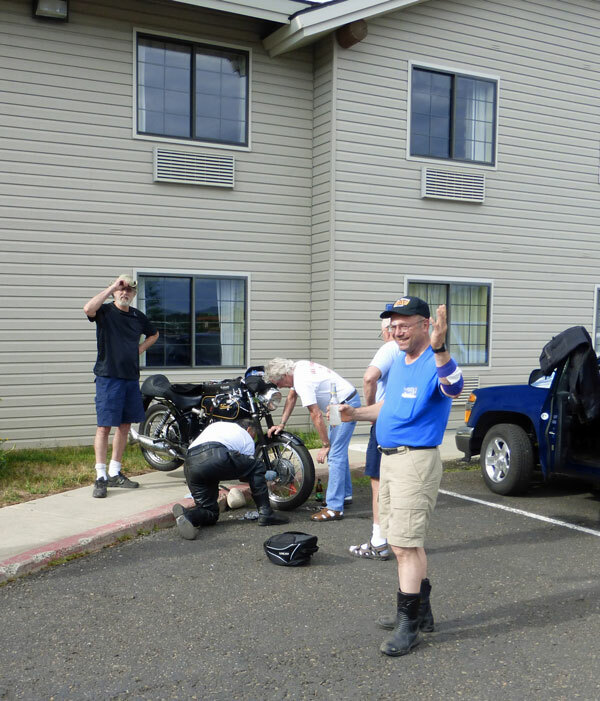 At one of the full stops, Jeff picked up a lug nut from next to Fred’s rear tire. We pulled over into the first available parking lot to check Fred’s tire and sure enough found he was missing one. Disaster was avoided, but the road had further challenges for us. The following events were compounded by the fact, that the beautiful ribbon of asphalt avoided lunch in any disguise. Later in the day, when we finally found a place for lunch, a car driver felt impelled to come out of the café and yell at me for cutting him off. I didn’t know what he was talking about and did what I could to de-escalate the emotions; I just agreed with him. Then he pointed to someone else’s bike. Aha! It was a case of mistaken identity. In between these two incidents was the near miss at the Wall of Death. 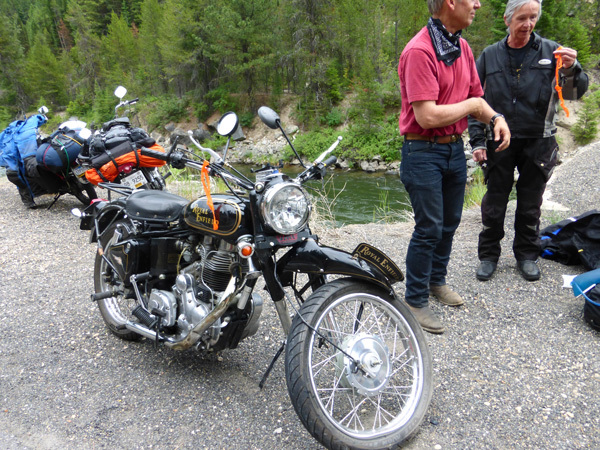 At Banks we turned north on 55, the Payette Scenic River Highway. At the end of a straight stretch of road, just before the road turned to run alongside the river, traffic stopped. Just as we pulled up, a woman ran over to me and said, “It’s one of yours.” Terrifying words. We rode around the cars to find Steve bleeding from head wounds and receiving first aid from a competent guy. 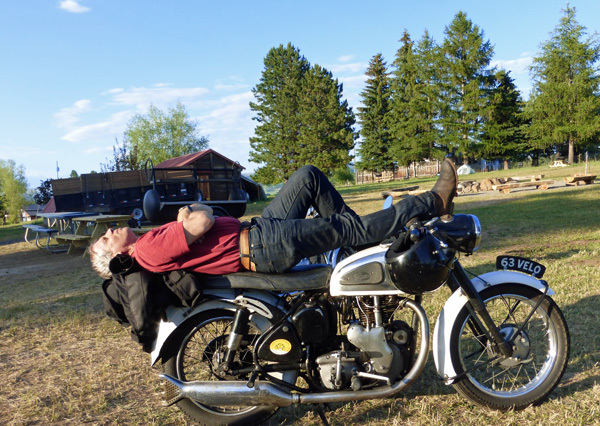 Steve’s modern Royal Enfield was upside down and leaking on the wrong side of the road. He’d missed the turn, left tire marks on the cement retaining wall, flipped back, and bounced across the road into oncoming traffic. Fortunately he was wearing all the protective gear and was in great physical shape. He walked away from the accident with scrapes and bruises. His bike was totaled. 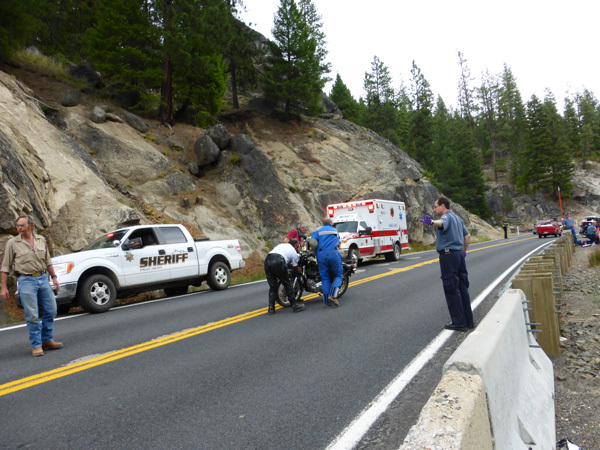 After a lot of wrestling, the guys were able to roll the bike to a wide space on the shoulder of the road. After all this we hit a patch of rain. This cooled things off, but lowered visibility. 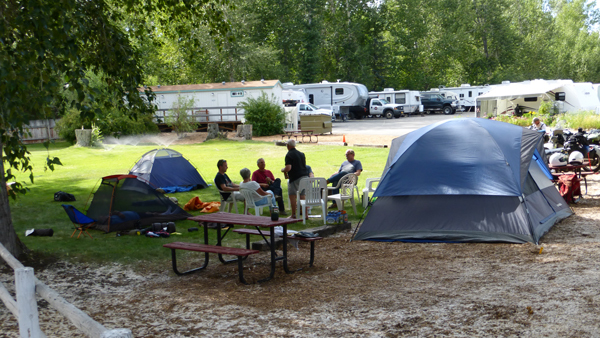 By the time we reached McCall we were all a bit frazzled, but we found ourselves in a great camp, near the hotel where other members were staying, and another airport. 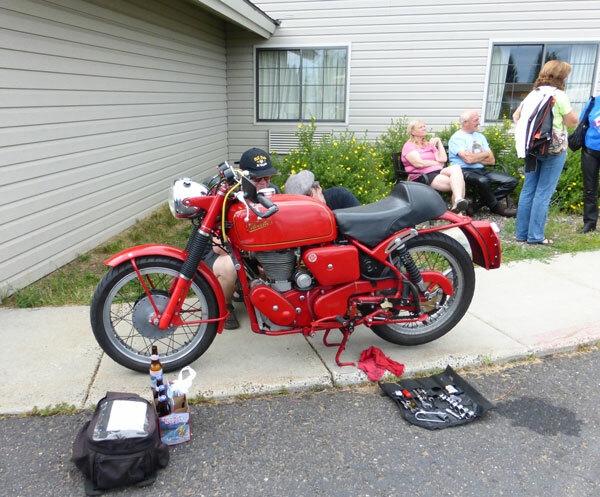 This entry was posted in Velocette & other British Motorcycles and tagged Idaho motorcycle rides, Lanora Cox, Velocette, vintage motorcycles, VOCNA. Bookmark the permalink.